Paul Willoughby's surfboard art is featured in "Blank." "Blank," a surfboard show for art's sake, on display at the Pegge Hopper Gallery, has at its core a group of friends who share a love of surfing and design. 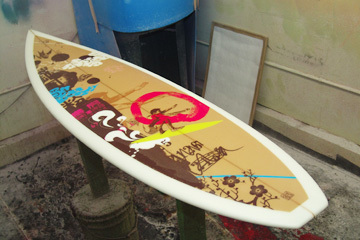 Artists contributed designs ranging from cosmic to '70s-inspired to Hawaii inspired works, such as the "Shaka" and "Chinatown Yacht Club" boards. For clothing designer Rona Awber Bennett, an avid surfer and one of the show's curators and contributing artists, applying the concept of art to surfboards has been a longtime dream. Other Oahu artists featured are Kandi Everett, April Lee, Pegge Hopper, Maile Yawata, Timothy P. Ojile, Rich Richardson and Jef Hartsel. Paul Willoughby, a London-based illustrator, also contributed. Beyond aesthetics, the surfboards have lost none of their wave-riding functionality. The boards, shaped by Eric Walden of Aipa Surfboards, were created in five shapes: 9-foot longboards, 8-foot mini longboards, 6-foot fishes, 6-foot-9 '70s style and 6-foot shortboards, all ready for various water conditions. The Pegge Hopper Gallery is located at 1164 Nuuanu Ave. "Blank" runs 11 a.m. to 4 p.m. Tuesdays to Fridays and 11 a.m. to 3 p.m. Saturdays, through June 3. For more information, call 524-1160, or visit the Web site blanksurfshow.com.